- Fatal de lo mio: They opened a shop in Madrid just a few days (weeks?) ago, and I will visit it soon, I loved Breaking the pana designs since I discovered them some months ago. Their illustrations are hillarious, aren't they?? - La tienda de Bri: I felt in love with her illustrations. 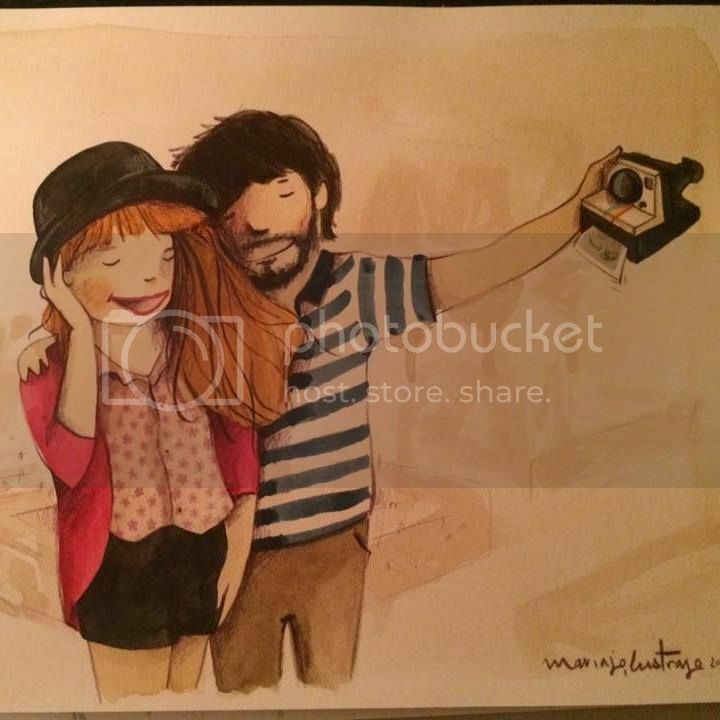 Just because I don't have any pic of her at Nomada Market, I have taken all the pics of her illustration from her Flickr, you can see more of them here and appreciate how beautiful they are! - Silvia Gándara. You can see and buy her beautiful items here. (The pics below were not taken by me, are some pics I've taken from her web for you to have a little sample of her works). - Conspiradoras. You can buy her things at DaWanda shop. PS. All of them have an online shop in their blogs (just click on their names). If you don't speak Spanish and want something, you could anyway write them there and tell them about it (if you need some help I could help you). Last but not least, thanks to the event organizers, specially Bea from Con dos bolsas en cada mano. So, did you like them? What's your favourite or favourites? Merry merry Christmas, my sweet Iris! I hope you have the sweetest time this holiday with your loved ones and family!! I'm so thankful for our bloggy friendship!! Espero que estés pasando unas fantásticas fiestas!! Ay por favor, qué de moneces!! Yo me hubiera hecho demasiados autorregalos allí, jajaja!! feliz Navidad, guapísima; estabas divina tú y tu sobrinita, eh? You look lovely!!! Thank you beautiful! OOOOh! I <3 your too. :) Keep it up, sis. Merry CHRISTmas to you too Iris! I love the picture with your neice:) This market seems unbelieveable! So much creativity! I am alive, no worries, my blog has been blocked by my ISP (I think) and I don't want to call the company for one website so either, one, I'm going back to blogger, or two, I'm going to another site. I will let you know soon! Have a wonderful day! Dear Iris, many thanks for stopping by in Bibi in wonderland and leaving a sweet comment :) Hope you had a wonderful Xmas too! So happy I discovered your blog, it's so nice! Hey gorgeous! I love your blog too! the photos are sooooo pretty! i wanna have all those stuff. thanks for your lovely comment <3. I don't think I can choose a favorite, they're all so adorable!! And that picture of you and your niece is the cutest thing ever! Merry day after Christmas! :) Your niece is so cute!! I love the little typewriter pin, that's adorable! And the illustration of the girl with the umbrella is so sweet! Hope your Xmas was lovely! Thanks for the lovely comment! I love your hair! Christmas is over now, but i wish you a happy new year's eve. me encanta este post, es una pena no poder verlo en persona! Pero que cositas mas chulas! yo tambien te sigo ya que tu blog tambien me encanta! Me han encantado las ilustraciones, que bonitas! Hope you've spent a great Christmas! Wow!! Looks like you had a lot of fun! I love markets like that! You look amazing as always!! You're so pretty! Your niece is so cute and I love your jumper! Thank you for your message on my blog girl! ;) I love your 20's Style! I know it is just too late but Happy Christmas too! Seems you are really into H&M outfit :) Nice. Thanks for dropping by on my blog. Link me too if you want! la primera foto me encanta! estais muy guapas las dos! Muchas gracias por incluirme en lo que mas te gusto de la feria. Como olvidar a esa pelirroja. I love the Conspiradoras stuff. It's amazing. Thanks for sharing. Me alegro que te gustara. Muchísimas gracias por asistir. espero que lo hayas pasado genial preciosa!! Gracias por la visita, nos encantó conoceros! Esperamos que se repita muchas veces mas y que nos volvamos a ver pronto...besitos! Conspiradoras y... me quedo con la frase "Beauty is nothing without you". Gracias por mantenernos informadas de eventos como este a las que no hemos podido estar allí. MUA!! The first photo is adorable! I'm now following your blog, love it and Happy New Year! Que post tan lindo, querida! such a cute picture of you with your niece! that market looks so dang awesome! I love the picture of you and your niece - your red hair is utterly fabulous!! Fantástico el post!!! qué cara de cansadas tenemos Sol y yo, jaja!! Me ha encantado, y me encantó conocerte, un besazo!! My gosh you are so beautiful! Your hair is stunning! Your music selection moves me. Keep on girl! Happy New Year! ciao, grazie per la visita.. il mio blog è ancora un pò poverello perchè non sono decisamente una maga del pc! il tuo, invece, è splendido per grafica e contenuti! p.s. pensa che sarò a Madrid proprio dal 3 gennaio in poi! this is so adorable- love all the pieces. and your head piece is fantastic girl! i love the cardigan you're wearing with the studded shoulders! and your niece is adorable, reminds me of an american girl doll in that picture! haha and those stores are amazing. my favorites are definitely la tienda de bri and conspiradoras! Of course que no me molesto! Al contrario gracias por decírmelo, que ha sido un desliz! Por cierto, me encanta tu blog! y qué de gente te sigue! ¡Gracias por el comment! Mis tiendas favoritas han sido "Noodles" y "Lady Desidia", aunque ninguno merece estar fuera. Siempre que es algo innovador merece la pena, y más si encima es diferente al resto. Sobretodo me ha gustado un bolso que sale en la foto de "Noodles" que pone "Haz el Amor y no la Guerra" en francés. ¡¡Es chulísimo! !